Peak flow is a simple measurement of how quickly you can blow air out of your lungs. It's often used to help diagnose and monitor asthma. A peak flow test involves blowing as hard as you can into a small handheld device called a peak flow meter. These are available on prescription or can be bought from most pharmacies. By measuring how fast you're able to breathe out, your peak flow score can indicate whether your airways are narrowed. 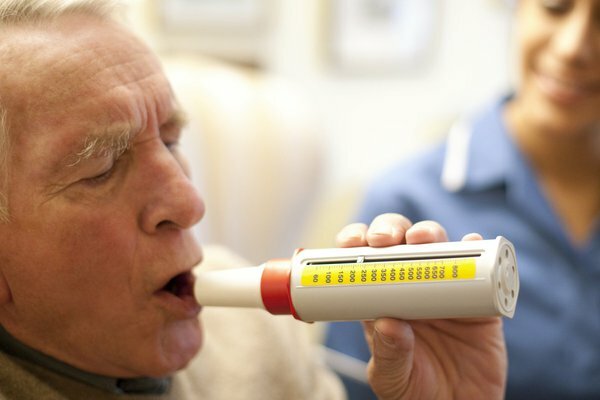 This could be a sign that you have asthma, although other tests such as spirometry will often be needed to confirm the diagnosis. If you've already been diagnosed with asthma, measuring your peak flow regularly can be a useful way of monitoring your condition. Your score can show whether or not your condition is getting worse. It can also check if your medication is working, and indicate whether you're having an asthma attack. Measuring your peak flow before and after exposure to a possible asthma trigger, such as something you're allergic to or a substance you're exposed to at work, may also show if anything in particular causes your symptoms. The first time your peak flow is measured, you'll be taught how to do it by a doctor or nurse. After this they may advise you to carry out the test regularly at home using your own peak flow meter. This should be repeated 3 times, and the highest of the 3 measurements should be recorded as your peak flow score. If you're monitoring your asthma at home, you may have a diary or chart to record your score. You can download a peak flow diary (PDF, 2.2Mb) from the Asthma UK website if you don't have one. What's considered a normal score depends on your age, height and gender. Ask your GP or asthma nurse for more information on what would be considered a normal score for you. To help diagnose asthma, your result can be compared to what would usually be expected for someone of your age, height and gender. A significant difference between your score and a normal score, or a difference in your scores in the morning and evening or when your symptoms are good and bad, may suggest you have asthma. If you're monitoring your asthma at home, your score should be compared to your best result at a point when your condition was well controlled. A big difference between your current and best score could be a sign that your condition is becoming poorly controlled or that you're having an asthma attack. If you have a personal asthma action plan, it might say what you should do when your peak flow score falls to a certain level. You may just need to use one of your inhalers, or you may need to seek medical help. See treating asthma and what to do if you have an asthma attack for more information. Speak to your GP or asthma nurse if you've been diagnosed with asthma and don't have a personal action plan, or if you're concerned about your peak flow score and don't know what to do. You can download a personal action plan (PDF, 681kb) that you can fill in with your doctor or nurse from the Asthma UK website, or they may give you one at your appointment. Your asthma action plan should be reviewed and updated at least once a year at your asthma review with a GP or asthma nurse. Take your plan with you to every asthma appointment – including any A&E or consultant visits – so that if there are any changes, your plan can be updated.